Last year, I came across an interesting question on Quora: Why should a brand do social media monitoring? For someone like me, who works in social media, the answer is obvious. But it may not be so clear to a small business owner. While keeping an eye on social media mentions can be a lot of work, it won’t cost you anything and the benefits are so great that it would be crazy not to, at least, consider including it into your online strategy. 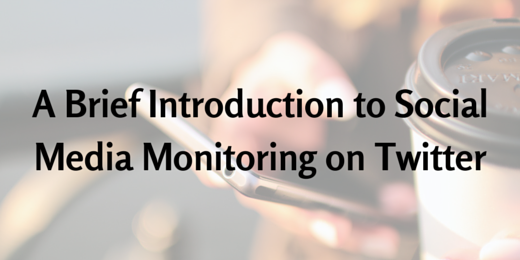 But first, what is social media monitoring, exactly? 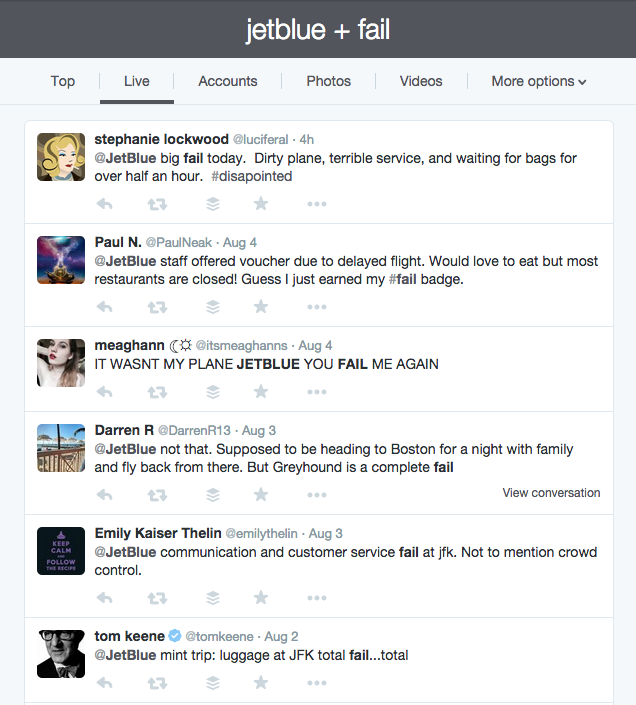 Monitoring allows you to catch digital conversations and know what users think or may be looking for. On Twitter, the most basic form is direct mentions, like the one below. Understand my audience better and create targeted and useful content / products for them. Catch problems, complaints, and questions — and address them accordingly. Connect with my readers and show them that there is a human being behind the account. Build great relationships with people and create a community of advocates. Those benefits are here for your taking too! However, you have to go beyond basic monitoring. One thing I always tell small business owners is this: Your customers may not be as social media savvy as you are. For example, you should never expect them to include your username in their Tweets. Actually, according to Conversocial, only about 3% of Twitter users mention brands directly! Yes, you read it right. If you only do direct mention monitoring, you are likely to miss 97% of conversations. And these often include complaints and questions. Not acknowledging them will turn your customers away from you and to a competitor. 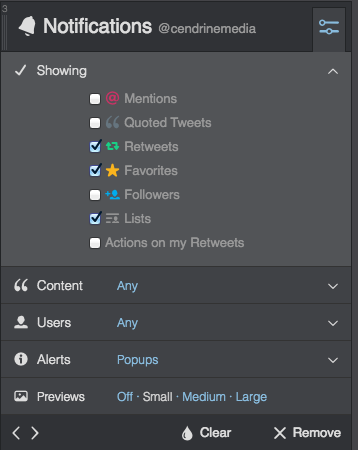 So, how can you cover all your bases and make Twitter monitoring work for your business? Here are some tips. The screenshots are from TweetDeck. HootSuite is a little different, but you can achieve the same results. Create a column for each of the following: your slogan, name, domain name, and the name of your website. 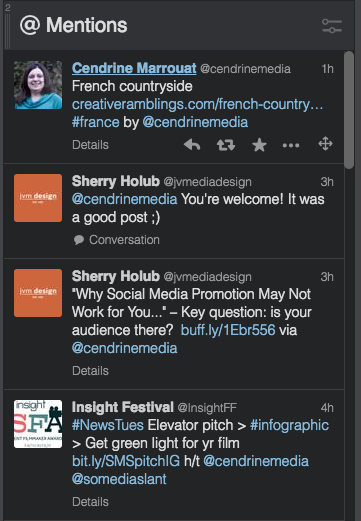 None of the Tweets above contains my username (@cendrinemedia) or a recognizable link. 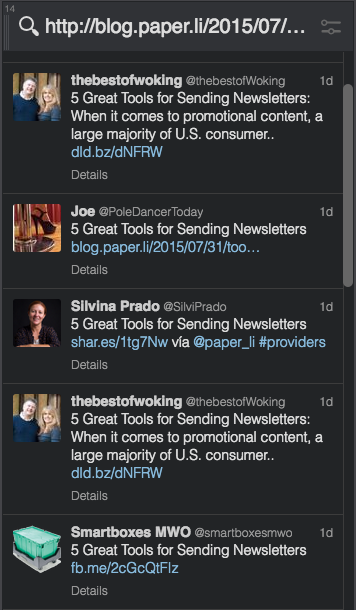 And yet, if you click on any of them, you will land on my blog. Monitoring your domain name gives you the best coverage possible. Every share will appear here! People tend to type fast and forget to re-read themselves. So, think of typos as well. Use Keyword Typo Generator to discover misspellings of your name, company, or domain name. For negative comments or reviews, follow the tips in this post. Answer questions as quickly as possible. Be honest if you can’t and do the necessary research. Recommending a specific Twitter handle is also a great way to start a conversation. When Twitter users share your content, mention them in a “thank you” Tweet. Should they respond, ask them a question to take things a little further. Some people will stop there. Others will be very happy you noticed them. Check out users’ profiles and click their links. See if you can support them back. Sometimes, a simple share will go a long way! Don’t get discouraged if nobody seems to care at first. It may take a few weeks before you get any reaction. However, since so few companies actually monitor Twitter that way and take the time to acknowledge individual users, you may also notice an increase in recommendations and mentions. As time goes by and more people share your content or talk about your small business, you may find the process of sending “thank you” tweets overwhelming. To make things easier, save you time, and avoid annoying your followers with a long series of repetitive tweets, create a Gratitude List and redirect people to it occasionally. Thanks for this information. I will try to put your suggestions into practice. My pleasure, Tim! Let me know how the tips work for you. Nice post, congrats !Have you ever tried http://www.tweetbinder.com ? I think you may like it. We can send you information or show you the potential of our tool. Thank you for your comment. Feel free to contact me at info@socialmediaslant.com. Thank you indeed for the helpful social media tips. keep on.